Community leaders spent a day in city classrooms this week to experience a day in the life of a school teacher. Council president Ruby Cotton was among 27 leaders to sign up for teacher for a day. She spent her Tuesday morning teaching a second-grade class at School 6. She found a very changed classroom from the time her own children were enrolled at the Paterson Public Schools. “When my kids were in school they didn’t have smart boards,” said Cotton. Every student in her classroom had a tablet, she said. Cotton had to quickly capture the short attention span of the students of the tablet age. She did so by reading a book about Harriet Tubman and tying it to the Underground Railroad monument less than ten blocks from the school. “I had their attention for a good ten minutes,” said Cotton. Their eyes opened up when the 4th Ward councilwoman told them there were Underground Railroad, a series of safe houses to help slaves escape to freedom, stops in Paterson. The community leaders were allowed to develop their own or use an existing lesson plan. 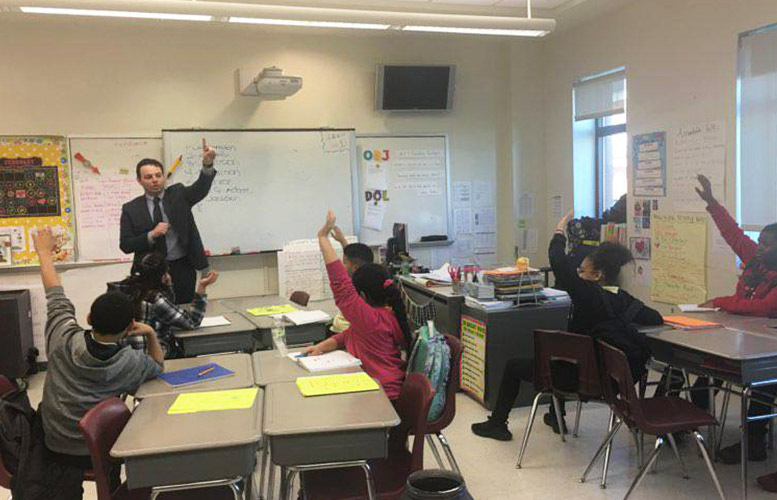 “We talked about the electoral college,” said councilman Andre Sayegh, a mayoral hopeful, who taught a sixth-grade class at the New Roberto Clemente School. He mixed geography, history, and political science. He explained to the students how Donald Trump clinched the presidency without winning majority of the votes. “It was an epiphany. Light bulbs were going off,” said Sayegh of the students. A history professor, who taught in William Paterson University, Sayegh explained the reason for having the electoral college, he said. Sayegh saw the experience as valuable. “It let me take the temperature of what teachers have to go through; what the students are learning, and to measure their intelligence,” he said. At School 28, superintendent Eileen Shafer, came in in her physical education garb prepared to teach gym. She hadn’t been before a class to instruct since 1989, she said. Her students played sideline basketball. She also taught them about famous African-American athletes in honor of Black History Month. “I had a whistle and I never used it,” said Shafer. “Back in 1989 I used the whistle a lot.” She recalled teaching math and English in the gym room. Physical education has somewhat changed in those decades. These days, physical education teachers use music to motivate students to move. That was the case at School 28. At the Hani Awadallah School, former Passaic County Technical Institute (PCTI) gym teacher, Al Abdelaziz, a member of the Paterson Planning Board, had a large class. There were not enough chairs for students in the classroom, he said at a reception. “I saw what our teachers are up against,” said Abdelaziz. The community leaders spent 3-4 hours in the classrooms. Many of them saw it as a valuable and eye-opening experience. “They were able to recognize some of the challenges that not only our teachers, but students face on a daily basis,” said John McEntee, Jr., president of the Paterson Education Association (PBA), the teacher’s union. McEntee described the teacher for a day event as a “massive success.” The union organized the event in conjunction with the district. “It went far beyond our expectations. There were so many positive interactions between the community, elected officials, school officials, our students, and teachers than we ever could have hoped for,” said McEntee. “I think it went very well. I’ve heard a lot of positive feedback,” concurred Shafer. McEntee wants to turn teacher for a day into an annual event. District officials said it was a voluntary event. Principals volunteered their schools and teachers volunteered their classrooms. Not every school participated. “I haven’t heard anything negative. So, I think we could do it,” said Shafer. However, she noted, a conversation has to occur with school principals and the union for it to happen next year. “I think they should do it at least two or three times a year,” said Cotton. Let me guess Oishin Castillo and Christopher Irving were no shows?